Lydia has given us permission to use her real name for this story. 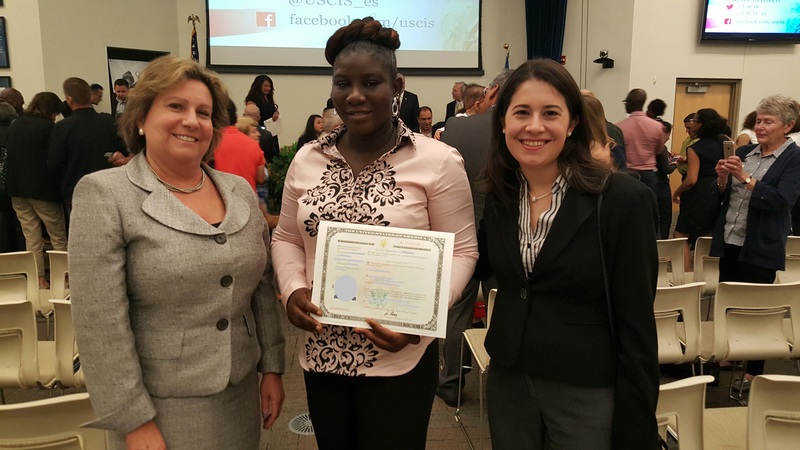 She is one of the United States’ newest citizens. Lydia has been an asset to the United States for many years, serving as one of the patient, caring people who tends to elderly people in their homes, giving our parents and grandparents the time and energy that we can’t take out of our busy lives. Yet Lydia was a victim of incompetence, indifference and outright heartlessness on the part of numerous US government employees. Lydia came to our office about five years ago. She had come to the United States from Ghana and had married a nice young man, a US citizen. He wished to sponsor her for permanent residence, so that she would be able to remain here and share her life with him. It is our policy to only take cases where we are convinced that the couple is “real”; we have declined numerous illegal “fraudulent marriage” cases over the years. After meeting with the couple and satisfying ourselves about their relationship, we prepared and submitted the necessary application forms, attended an interview with the couple, and the case was approved in due time. Since Lydia had not been married for two years when her case was approved, she was required to renew her permanent residence two years later, to again prove that she was not in a sham marriage. We met with the couple and again submitted the necessary application package on August 12, 2012. And then we waited. We got a formal Request for Evidence in the mail and submitted additional documents. And then we waited. The couple was called in for an interview. The interviewing officer asked for additional documents. We provided the additional documents. And then we waited. The interviewing officer was reassigned before he closed out the case, so the couple was called in for a second interview, which we attended together. And then we waited. We finally got tired of waiting. Because she had been a permanent resident for well over the required three years, Lydia was eligible for US citizenship, so we prepared and submitted that application package. She was called in for an interview within a reasonable amount of time, but the officer told us she could not approve the case until the permanent residence renewal had been resolved. I reminded the officer that the regulations require that a citizenship application be approved or denied within 120 days of the interview. We left the interview. And then we waited. After 120 days, we wrote to several supervisors, advising them that the interviewing officer was violating the regulations by not finishing out the case within 120 days. And then we waited. During all of this time, Lydia missed the funerals of two good friends in Ghana. She wished to visit her father in Ghana, whose health is not good. But she was afraid to travel while her various applications remained pending. There is always the possibility that if an application is denied while the foreign national is overseas, she will not be admitted back into the United States. So finally, after about 150 days of waiting for a decision on Lydia’s naturalization application, we took the matter to federal court, seeking the judge’s order requiring US Citizenship and Immigration Services to follow its own regulations. And then we waited. The government was required to respond to our complaint within 60 days, but asked for an additional 30 days. We agreed, since the judge would have allowed the delay with or without our agreement. The US government just gets to do that, with no excuse. Finally, on the 90th day, August 10, 2015, almost exactly three years after Lydia started her renewal odyssey, we learned that USCIS had approved her case, so that its officers would not have to explain to a federal judge why the USCIS was violating the law. She took her oath of citizenship on August 25. We normally don’t go to these oath ceremonies, but we chose to go to Lydia’s to share the end of her very difficult ordeal. We are thrilled that she will continue to be an asset to this country, to our parents and grandparents, and that her long wait is over!